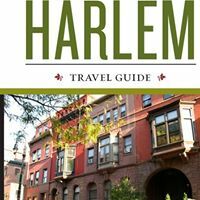 HARLEM—Five years after it was shuttered and relocated, the National Park Service will reopen Hamilton Grange, the home of Alexander Hamilton, one of the nation’s founding fathers. The Grange, built in 1802, originally stood on Hamilton’s 34-acre estate on the site of what would eventually become West 143rd Street. As the street grid developed, the house was moved in 1889 to save it from demolition. 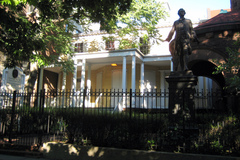 The Federalist-style home was moved again in 2008 to the southeast corner of St. Nicholas Park at West 141st Street. The once-neglected building, which underwent a meticulous $14.5 million renovation that restored many of the home’s historical elements, will open to the public Saturday. The home has been restored to resemble as closely as possible what Hamilton would have seen for the two years he lived in the home, including the original paint colors. In restoring the home, the park service also hopes to reanimate the discussion about one of this country’s lesser know, yet influential founding fathers. Hamilton, who was born out of wedlock in the West Indies, was instrumental in helping to get the Constitution adopted. He founded the agency that would become the U.S. Coast Guard and served as the first Treasury Secretary from 1789 to 1795. The only New Yorker to sign the Constitution, he was an advocate of a free press and founded the New York Society for Promoting the Manumission of Slaves. He also founded the Bank of New York. “In many ways, his was the quintessential New York story. He was an immigrant from the Caribbean who came here with little more than his skills, ambitions and his mind who made a name for himself,” said Rambo. The Grange is the only home Hamilton was known to have owned. Hamilton only lived in it for two years before he was killed in a duel with Vice President Aaron Burr in 1804. The restoration includes reorienting the house so that the front entrance to the home is back in its original location. The original staircase to the home has been restored, in addition to the parlor room, which includes some of the original chairs. The dining room and Hamilton’s study also includes historical furnishings. The original, but non-working, piano played by Hamilton’s daughter Angelica is also present. The over-sized mirrored doors of the dining room, which are the same size as the windows in a design touch meant to bring the outdoors inside, have also been restored. The dining room windows are triple hung and designed to be used as doorways to the side porches. Architects opened walls and reexamined some of the previous restoration plans conceived before the move. They looked for the home’s structure to tell the house’s history. The investigation was crucial because it allowed some of the home’s original pieces to be rediscovered. During a previous renovation, the tops of the oversized dining room doors had been sawed off. Architects found them being used as a brace elsewhere in the house and restored the doors. “The restoration took longer than anticipated but this was worth it because the house told us what it looked like and it allowed us to bring it much closer to what Hamilton would have seen himself, said Rambo. Actors portraying Hamilton and 18th century New Yorkers will be on hand Saturday in full costume to give visitors a taste of what Hamilton’s life was like at the Grange. Savona Bailey-McClain, executive director of West Harlem Art Fund has curated a work by artist Abigail Simon that allows visitors to see and hear a historical representation of the sites and sounds of the Grange using their smart phones. “A lot of people don’t know this history,” said Bailey-McClain. “The site is such a huge improvement over the previous site that its reopening is a great thing for West Harlem,” said Brad Taylor, vice chair of Community Board 9 who has worked on issues regarding the Grange over the years. “It will will bring more prominence to Hamilton, his legacy and his immigrant background because we are a community of immigrants,” said Taylor. The previous site of the home at 287 Convent Ave. will remain as a garden. After seeking suggestions from the public, Rambo said the overwhelming majority of respondents wanted to retain the garden. “The National Park Service recommendation is to leave the Convent Avenue site as green space for the community,” said Rambo. Taylor said many West Harlem residents will be pleased to hear the news. “With this solution we don’t lose any open space and we gain a permanent garden on Convent Avenue in a historic neighborhood,” said Taylor. A few years ago, talk of removing the home from the neighborhood was met with stiff community opposition. Now, integrating the home into the Hamilton Heights neighborhood, which is named after Hamilton, is a major goal of the National Park Service, said Rambo. The Grange contains a new visitors center and exhibit space that will feature a time lapse film of the home’s move and a history of the neighborhood. Soon, area residents will be able to make an appointment to give their oral histories of the neighborhood and talk about what the house means to them. “Because of a lot of the things happening in the economy and financial markets people are talking about Hamilton again. This is our opportunity to say he was more than economics. We wanted to honor Hamilton’s legacy and his importance to the neighborhood and the United States,” said Rambo. Hamilton Grange, located in St. Nicholas Park at West 141st Street, will re-open to the public with a celebration from noon to 5 p.m. Saturday, Sept. 17. On Sunday, Sept. 18 from noon to 4 p.m., there will be a lecture series featuring speakers discussing the house, neighborhood and Alexander Hamilton.